Bumble’s intention was to introduce potential customers the many uses of its app beyond dating, notably to help job seekers find work and employers to find new hires. The app also helps with networking, including those looking for project funding, such as young female filmmakers. At the SXSW space, Bumble was offering “speed mentoring sessions” as a way to help young people find good mentors for the work they are interested in pursuing. One of Bumble’s latest job-focused features is allowing employers to filter so that they only look at female job candidates, especially in fields where there is a shortage of female workers. Of course, Bumble is also introducing people who stop by its pop-up location to the many features of its core dating app. The company hired an astrologer to give birth chart readings (users can add their astrological signs to their profiles), as well as profile experts to help give customers a fresh start. 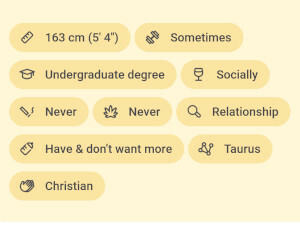 Bumble was also using its SXSW event space to advertise its new badge feature, where people can populate their profiles with visual badges relating their interests (added in Oct of 2018 and is part of the profiles basic information). For example, an animal-lovers brunch was planned for those users in the area who have a pet-lover badge. The company also scheduled special events to take place at its pop-up that relate to SXSW, including a talk with Director and Actress Olivia Wilde and the cast of her new film Booksmart. Also on the menu: attendees got to enjoy free coffee and tacos. 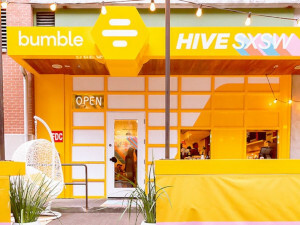 Bumble’s pop-up coffee shop ran during the length of the festival, through Sunday March 17th. For more on this dating service you can read our review of Bumble.